Customers demand reliable and high quality products at the lowest possible cost. Accordingly, it is incumbent upon manufacturers such as The Raymond Corporation (“Raymond”) to look continually for opportunities, when possible, to streamline the manufacturing of its products to meet customer needs. In this regard, Raymond was introduced to Boothroyd Dewhurst Design for Manufacturing and Assembly cost reduction software in 2006. Since that time, Raymond engineers have been able to incorporate the costing tool in the design and manufacture of Raymond’s full line of electric forklift trucks. The DFMA software was used to assist in the redesign of the hydraulic cylinders on the Model 7400 Reach-Fork® truck, in which part count was reduced significantly while maintaining product and component quality, functionality, reliability and reducing cost. The Raymond Corporation is the North American leader in the design and manufacture of the most reliable narrow-aisle electric forklifts. From orderpickers and Swing-Reach® trucks to stand-up counterbalanced and Reach-Fork® trucks Raymond provides material handling solutions that improve the efficiency for its customer’s warehousing and distribution operations. Located in Greene, New York, Raymond started as a family-owned business in 1922. Over the last eighty-six years, Raymond has revolutionized the material handling industry by leading the way through its innovation and reliability of its products. In 1934, Raymond invented the first commercially successful hydraulic hand lift truck. The 1950s saw the introduction of the first narrow-aisle and first Reach-Fork® trucks. The Model 700 Spacemaker was the first narrow-aisle lift truck to work in aisles less than seven feet wide. 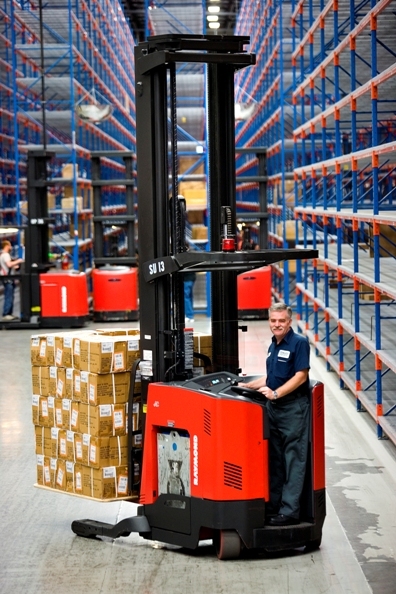 Raymond also introduced the first computer-controlled drive system for material handling trucks in the 1980s and followed in 2001 with the first AC-powered Reach-Fork® truck. A variety of industry leading Raymond lift trucks are produced at three plants in Greene, New York, Muscatine, Iowa, and Brantford, Ontario, Canada. Raymond is part of the Toyota Materials Handling Group, which is the largest lift truck manufacturer in the world. Raymond first used Boothroyd Dewhurst DFMA software in 2006. Small teams of four to five design and manufacturing engineers were assigned to use the software on two small trial part count analysis projects. The two items to be analyzed were a lift truck overhead guard weldment and an operator’s display mounting weldment. The goal was to use the DFMA software to determine part count for multiple design iterations and alternate manufacturing opportunities while maintaining product and component functionality, quality and reliability. These two projects let Raymond engineers learn the software and essentially test the part count and costing tool in the Raymond development process. Both projects yielded opportunities for reducing part count and associated costs that have been implemented to offset material and transportation cost increases. The next phase of using the DFMA software consisted of two members of Raymond’s Mechanical Design Engineering (MDE) group using the software more extensively on part count reduction activities. The timing of using the software was coincidentally advantageous as the MDE group was assigned to a product improvement project of considerable magnitude. Looking to offset material and transportation cost increases on Raymond’s Model 7400 Reach-Fork® truck, the MDE group performed a detailed part count analysis on the elevating section of this lift truck. 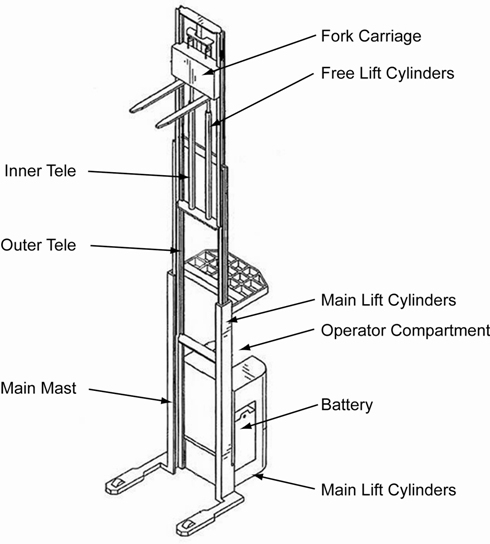 The elevating section of a lift truck consists of three telescopic frames that are raised and lowered by hydraulic cylinders. As the cylinders extend, two sets of lift chains mounted to the telescopic frames lift the fork carriage that carries the pallet and load to the desired height for storage or retrieval in warehouse storage racks. This investigation into the Model 7400 Reach-Fork® truck found many areas in which to apply the DFMA software. All areas of the truck seemed to have some possibilities where a manufacturing cost savings could be pursued. From the elevating section to the tractor and operator’s area, the MDE group found parts and assemblies that were analyzed using the DFMA software. The truck’s hydraulic cylinders yielded the most significant of these opportunities. This study will detail how the Boothroyd Dewhurst DFMA software was used to assist in the part count reduction of the Model 7400 Reach-Fork® truck. There are two sets of hydraulic cylinders installed in the elevating section of this truck that provide the lifting mechanism to the forks. They are referred to as the “main lift” cylinders and the “free lift” cylinders. Part counts were reduced for both sets of cylinders but more focus was applied to the free lift cylinders due to the intricacy of the design. The main lift cylinders elevate the outer telescopic mast, which in turn elevates the inner telescopic mast via lift chains connected to both inner and outer masts. The free lift cylinders provide elevation to the fork carriage. The fork carriage is an assembly that rides along the interior of the inner telescopic mast and has the lifting forks assembled on the carriage front. The purpose of the free lift cylinders is to provide lift to the fork carriage without extending the elevating section and maintain the overall collapsed height (OACH) of the truck. The OACH is the measured height of the truck when the elevating section is fully collapsed. This is beneficial when transporting loads through warehouses without the mast extended and clearing any transitional doorways at a fixed height. At the full extension of the free lift cylinder, the hydraulic system starts extending the main lift cylinders. The term used to describe this event is called “staging.” Essentially, it is the transition of the free lift cylinders extending followed by the start of the main lift cylinders extending. Raymond has developed a patent number US 6,557,456 B2, staging free lift cylinder that cushions the fork carriage and load during the staging event. This patented cylinder reduces noise and shock during staging impact. The first step was to examine the current staging cylinder design and brainstorm ideas as to how to reduce part count of the patented cylinder without losing any cushioning or having an increase in noise during staging. A part count and resulting cost reduction was required to offset the rise of material and transportation costs. Each idea was investigated to determine the effect on performance and part count of the staging cylinders. This is where the DFMA software was effectively used to quickly estimate potential changes in cost with each new design idea. The value of the DFMA Software came to be realized as Raymond engineers could, in a timely fashion, project the cost of new designs and then through determining the feasibility of the new design, decide the best course of action. The new designs were efficiently reduced to the most beneficial idea. The analysis of the staging cylinders started with determining a baseline cost using the DFMA software. From there, the new design was analyzed for cost to compare with the baseline cost. The promising results led to building prototype versions of the redesigned staging cylinders. After cycling the prototypes to acceptable levels without any adverse effects, Raymond decided to introduce the redesigned cylinders into production. The newly designed cylinders delivered virtually the same performance from the cushioning and noise standpoint. This redesign was a collaborative effort that included Raymond’s Greene Manufacturing Operations. During the course of the product improvement project Greene Operations was concurrently updating their hydraulic cylinder assembly area with a goal of increasing the operating efficiency. In addition to the redesign of the staging cylinders and cost analysis with the DFMA software, Greene Operations contributed to the redesign with suggestions for improved manufacturing methods. Both main and free lift cylinders housings are made from drawn-over-mandrel steel tubing. This tubing is cold drawn electric resistance welded tube with all flash removed. Greene Operations suggested that eliminating machining operations currently performed on the cylinder housing would enhance manufacturability in the hydraulic cylinder assembly area reduce cost. The new design saw a traditional two-part design reduced to one part. A combination end cap/manifold eliminated welding the existing manifold to the tubing side. This removed machining from the tubing and reduced welding times considerably. The top end cap also changed and went from being retained by a snap ring to becoming a screw-on end cap. This also reduced machining to the tubing and made for an easier removal of the end cap for seal replacement. The free life chain anchors were also reduced from a right and a left hand part to a common one used on both right and left free lift cylinders. Lowering the chain anchor also allowed manufacturing to weld the anchor in a different order in the assembly process that reduced assembly time. Analyses of the internal assembly also led to using more common parts on both the main and free lift cylinders. While the main lift cylinders also benefited by using the one-piece end cap/manifold, the staging cylinders were able to borrow the lower cushion assembly from the main lift cylinders. The lower portion of each cylinder, main and free lift, acts as a cushion as well when the cylinders retract and collapse the mast. Using common parts increased annual part quantities used and lowered part cost in some cases. The hydraulic cylinder assemblies were analyzed with the Design for Assembly (DFA) software. Some existing and all new cylinder piece parts were analyzed using the Design for Manufacturing Concurrent Costing® (DFM) software. These analyses quickly showed that the new designs would lower assembly part count and allowed Raymond Purchasing to use the DFM results when procuring the new parts. The following table shows the comparison of the old and new free lift staging cylinders. Using the DFMA software allowed Raymond engineers to identify the highest potential part count reduction early in the redesign process. Overall, the MDE group was able to reduce manufacturing costs to the Model 7400 Reach-Fork truck main and free lift cylinders to offset material and transportation cost increases. The free lift staging cylinders benefited the most by part count reduction. The existing design used 37 parts. The new design now uses 28 parts. Other benefits resulted throughout the course of this cost reduction exercise. The MDE group was able to reduce part number inventories for each main and free lift cylinders. The Model 7400 Reach-Fork truck went from having four different main lift cylinder parts numbers to now only one. The free lift cylinder part numbers went from eight to six. The hydraulic lines had to be altered to accommodate the new cylinders and benefited from a part count reduction and improved efficiency in the assembly process. This product improvement project was a tremendous success for the MDE group and The Raymond Corporation and resulted in components of the same quality, functionality and reliability. Because of the success from last year’s product improvement projects combined with the experience of using the Boothroyd Dewhurst DFMA software, Raymond is now in the process of integrating the use of the software into its culture. Members of the MDE group that were involved with the product improvement efforts have taken part in developing a recommended practices procedure for using the DFMA software in-house. The goal now is to use the DFMA software at the beginning of development projects as a cost attainment tool to determine more accurately part count and cost from the beginning to the end of a project. Also in process is developing a database of Raymond’s Greene Operations machinery in the DFM software. These steps are being taken to ensure further success with the DFMA software during the development of Raymond’s leading brand of lift trucks. Raymond was able to offset escalating material costs on its popular Model 7400 Reach-Fork® forklift trucks with a product design optimization using DFMA® software.